In line with failing to be a healthy vegetarian, I consume a lot of pizza. 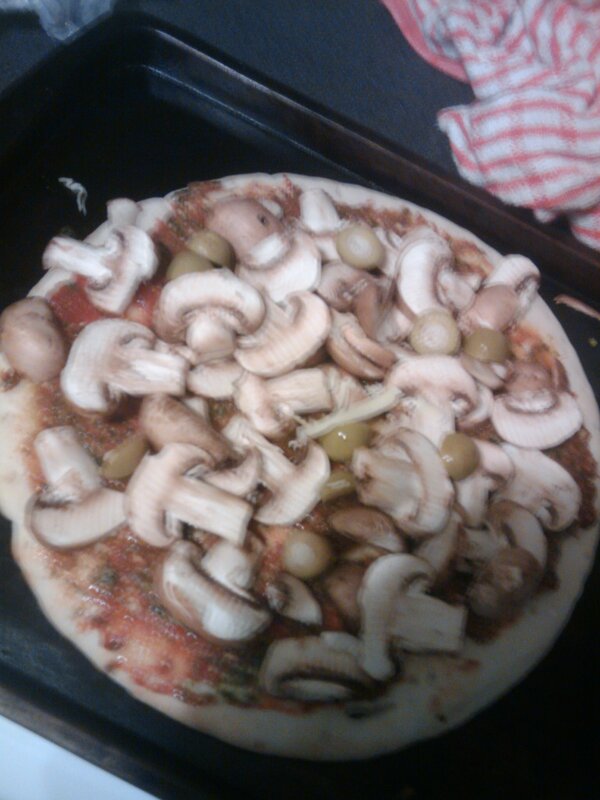 In past this was always takeaway, but I’ve recently be making a lot of my own pizza at home instead. 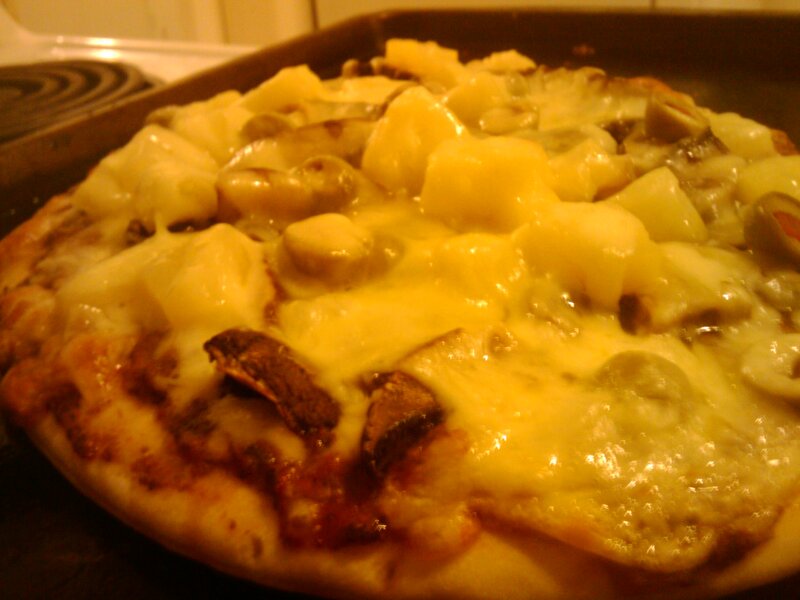 Mainly because I’ve been dissatisfied with the local pizza chain, plus I figured out a way I can make really tasty pizza in about 15mins which is really all the time I have for cooking. 1. 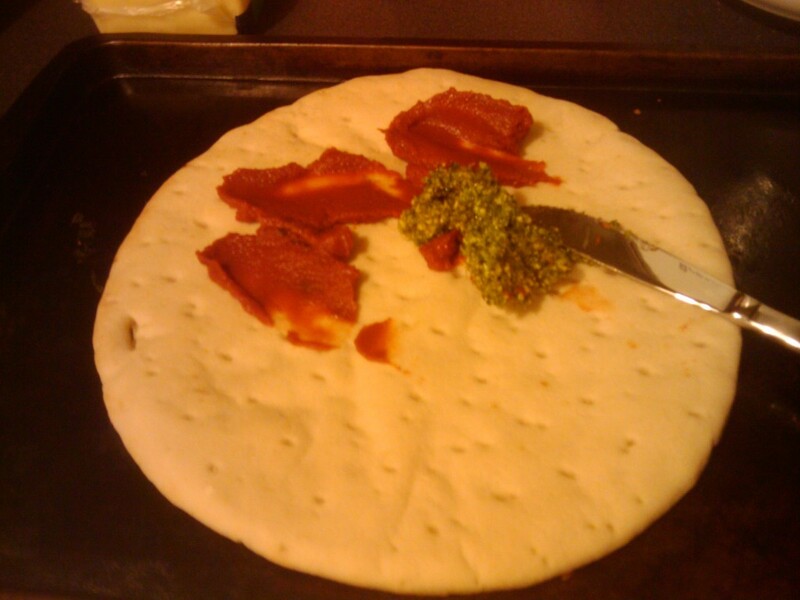 First, start with a pizza base – I tend to use premade ones, but you could certainly make your own if you feel so inclined – and spread a mix of pesto and tomato paste over it. The exact amounts need to be to taste, depending on how much you life either flavour – both the pesto and the tomato paste are pretty strong, but go brilliantly together. 3. Cheese. This is what takes the pizza from yummy to mouth-watering-deliciousness. In the past I used 100% mozzarella, but these days I’m doing a mix of 2/3 tasty/chedder cheese and 1/3 mozzarella. This provides a delicious mix of strong flavour along with stringiness and the great taste of the mozzarella running through the pizza. It also makes the pizza a bit more cost-effective since chedder tends to be a lot cheaper than the mozzarella at the supermarket (on a kg vs kg basis). I make sure to buy vegetable-rennet cheese, if you’re cooking for vegetarians make sure to check whether they are worried about animal-rennet vs vegetable-rennet (some of us are, some of us aren’t) before buying the cheese. If the type isn’t labelled on the ingredients list, it’s probably animal based. 4. 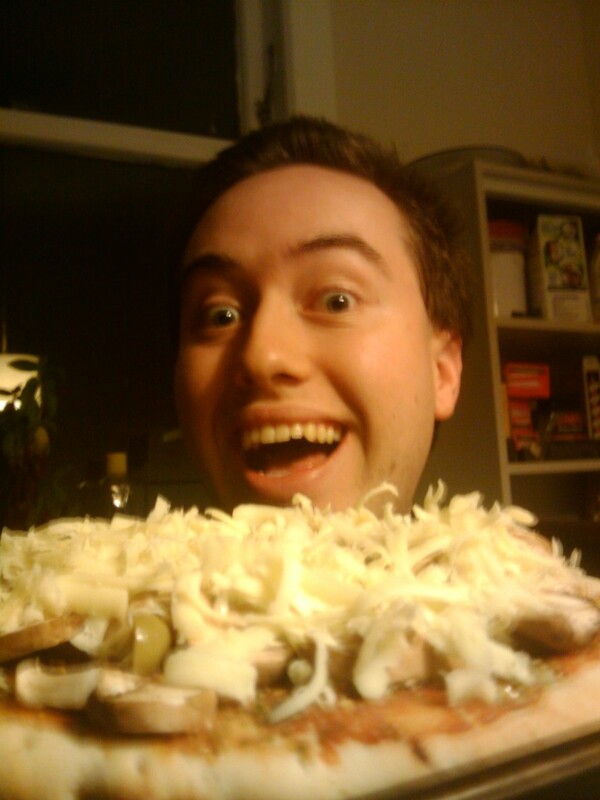 At this stage you should express your insane glee at the delicious creation before you. 5. 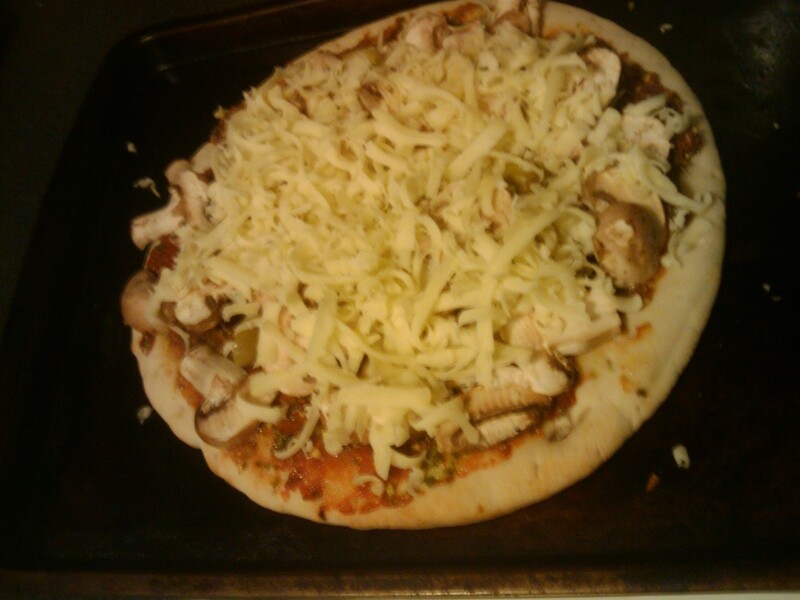 Put it into the pre-heated oven at 180c for about 15mins till the cheese is starting to brown (well, semi-preheated – I turn it on when I start making the pizza which takes about 5mins). One of these pizzas will fill a hungry 20-something male like myself, if you’re sharing with a guest, chuck in some garlic bread and it should end up as a filling meal for two.